With summer in full swing here in Alabama, this girl needs to add some multi functional pieces to her wardrobe for weekend getaways and such. Recently, I've been playing with the thought of adding a dark denim skirt to my closet for two reasons: 1) I haven't owned a dark denim skirt in ages like when I wore Keds with two socks ages. 2) This would be a good piece to have for both day and night summer fun. I'd just begun my search when the team from Christopher and Banks reached out to me about their new summer collection. And guess what??? A dark denim skirt was in the collection, excuse me... 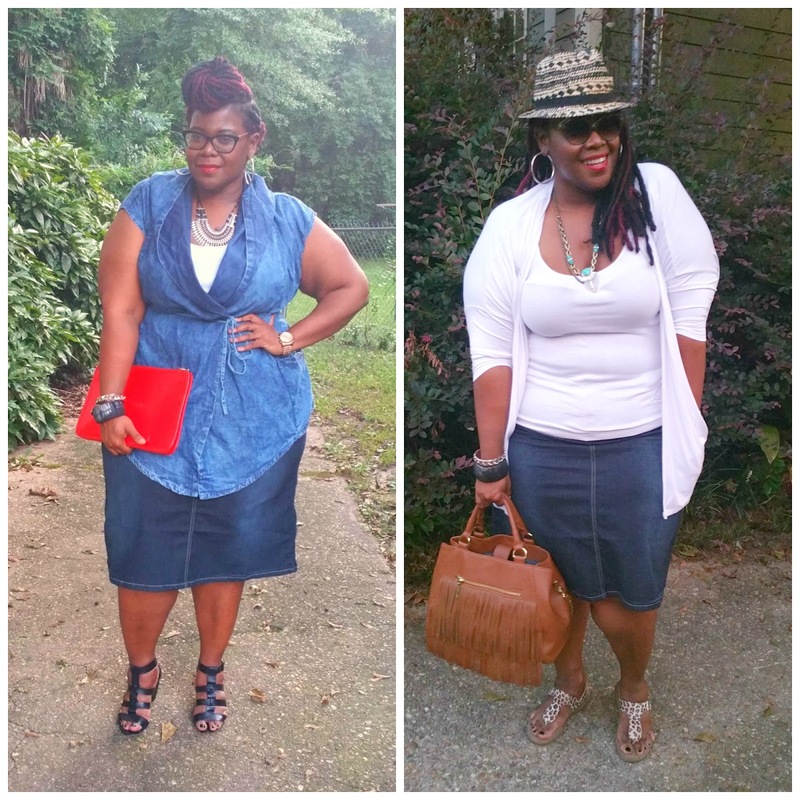 Dark Denim Pencil Skirt...even better right? I had to have it and share it with you. Check out the two ways I decided to wear my skirt for the weekend. Now because this is a new style adventure for me, I had to seek some inspiration. I always turn to Pintrest for inspiration and direction when I begin to think about a new look. 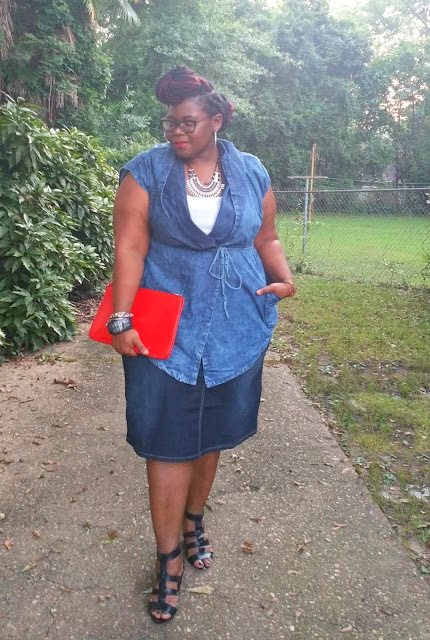 I came across several pins playing with chambray and dark denim, I knew immediately this was definitely a look I wanted to try. This cute light weight hooded cutie is the Lexie from Fashion to Figure. The two shades of denim is a perfect combination for a night out with girl friends or potential suitor. 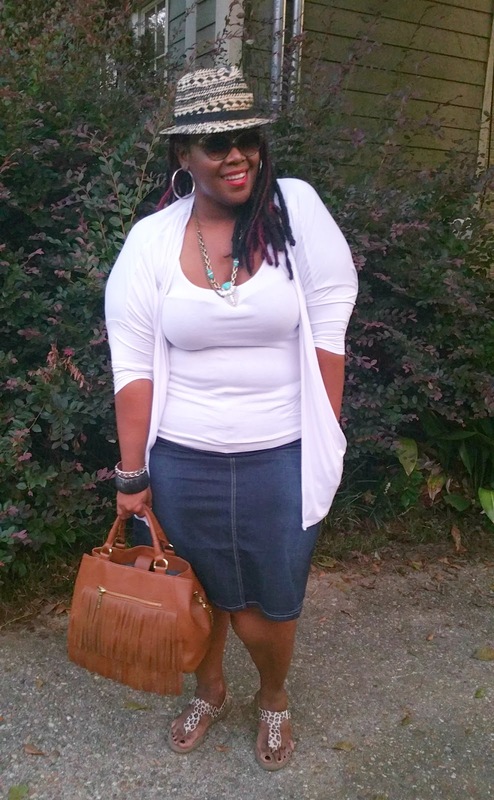 I felt chic and relaxed with this look. Perfect right? The second look was all about pure summer relaxation. 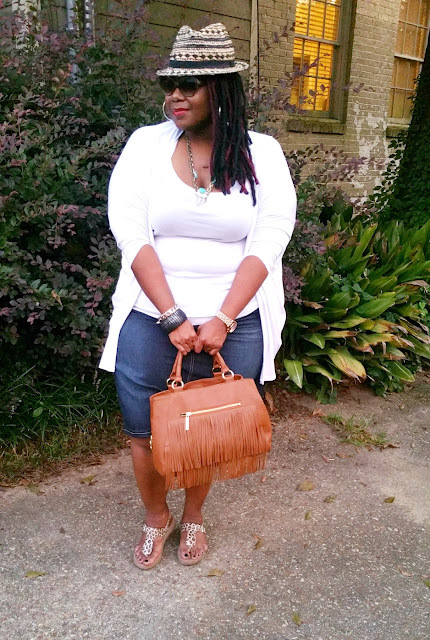 White tank, cardigan, straw hat and fringe bag just screams relaxed Sunday. This is something I would wear for brunch with friends or Sunday dinner with family. I even thought about a mini vacation weekend, yes this would be perfect for this. The white tank and cardigan are both from Lane Bryant. 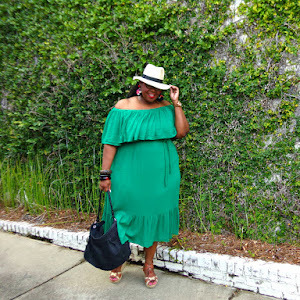 Can you tell how relaxed and ready to stroll the summer streets festivals in this look. 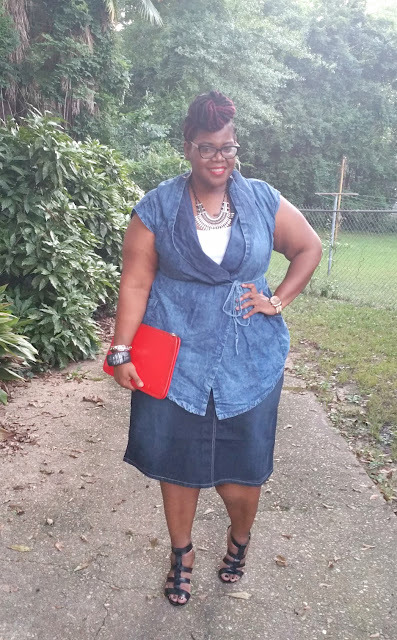 My tip for this summer trend: I don't think you I can go wrong with denim. 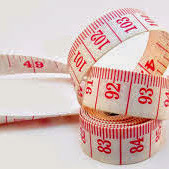 The overall fit of the skirt is very true to size. 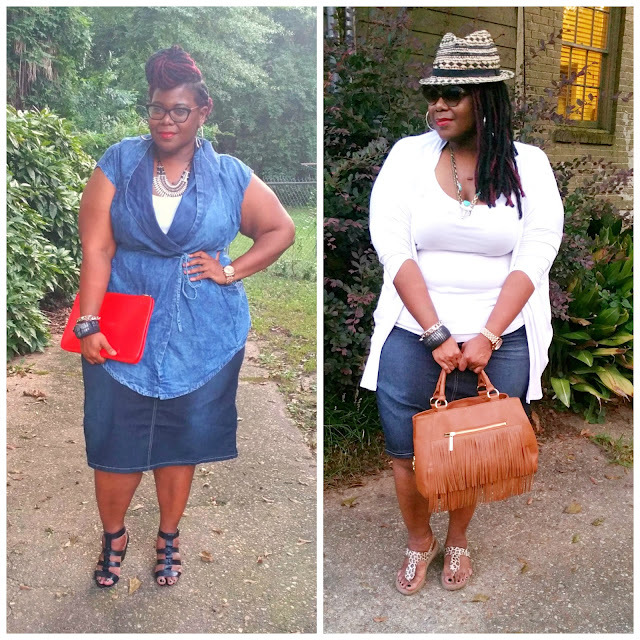 This skirt has the same soft denim feel and stretch that I've come to love and the length hits right at below the knees. So this is a winner in my book! Team thickthighs has approved this pick. I really can't tell you how excited I was to hear about another great denim piece from this brand. 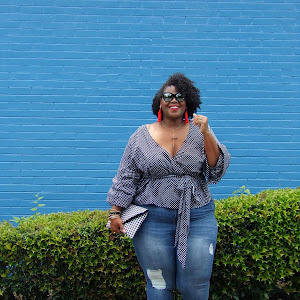 Did you see my post with those awesome ankle jeans from Christopher and Banks? Allow me to refresh your memory here. 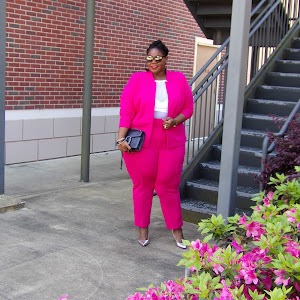 Here's your chance to win a piece from the Summer collection from Christopher and Banks! I love the denim on denim combination!! Very lovely! I love denim skirts-especially dark denim. I don't care how "unstylish" people say they are, I keep one in my closet at all times.